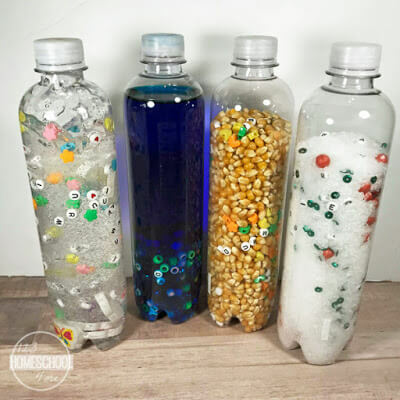 Kids are going to love making and playing with these 4 seasons DIY Sensory bottles! One of the most natural fascinating things in this world is how the seasons change. Without warning Spring can appear or winter may delay it. We have no way to control the seasons and no way to know exactly what is going to happen. This can be exciting and also frustrating. It is a super fun thing to learn about, though. My daughter loves it. 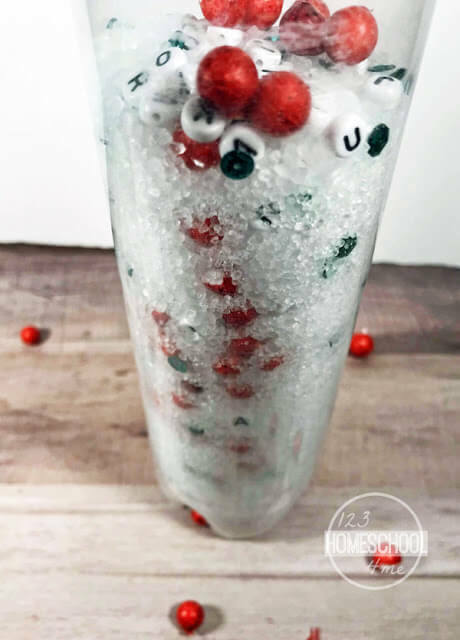 The 4 Seasons also make for a fantastic theme for I Spy Bottles! 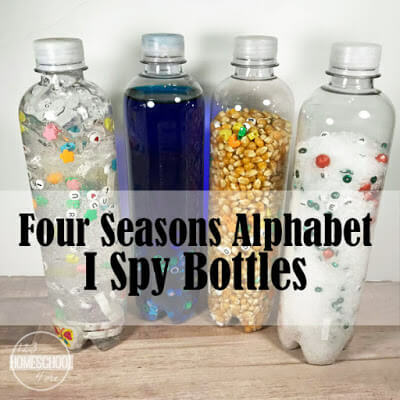 We created these Four Seasons I Spy Bottles together and they turned out so fun. We also added ABC beads to each of them, but this was just an extra element that we wanted to add. This is not required! Each bottle is created with basically the same technique. 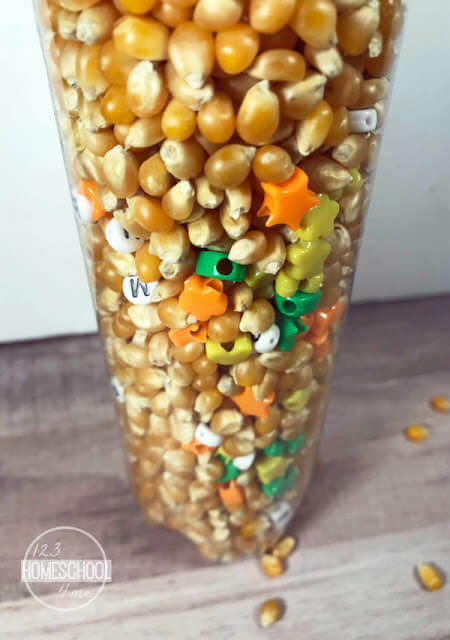 I like to put a layer of the filler (empsom salt, hair gel, colored water or corn kernals) then add some of the extras (beads, mini erasers, sequins, etc). Then keep layering it like a good lasagna. I like to use a funnel to fill it so that the filler pieces don’t fall out and get all over. I do the layering process because it is easier to get everything mixed up more evenly. 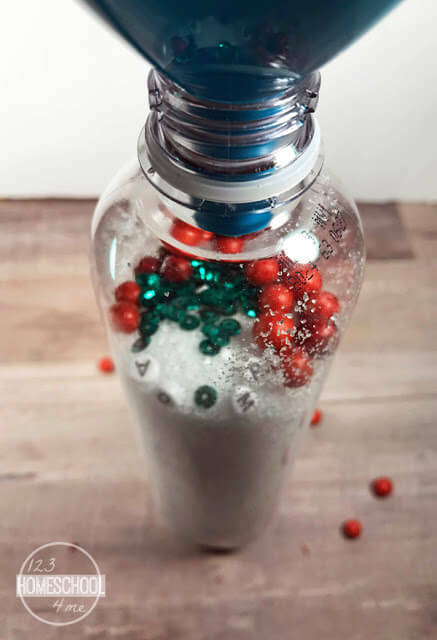 The bottle is filled to the desired level, close the lid as tight as possible. I didn’t do this but you could easily add some super glue to the inside of the lid to insure that the lid can’t get off. 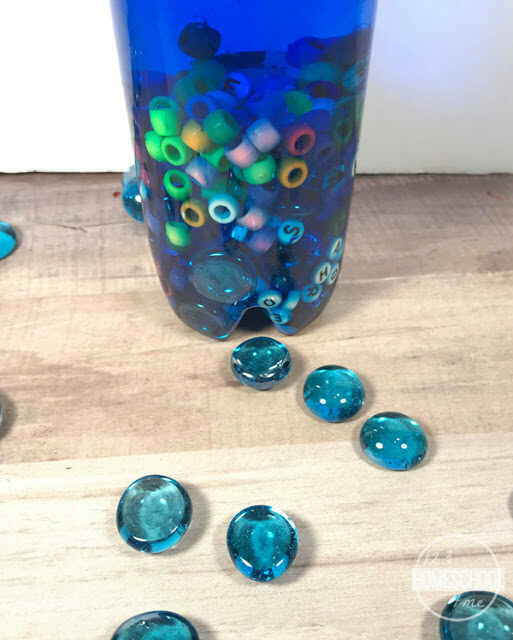 We had so much fun making these bottles. They were so easy, we were done within 45 min. Another plus is that most of the supplies we found at the dollar store. My daughter starts by picking which bottle she would like to use. 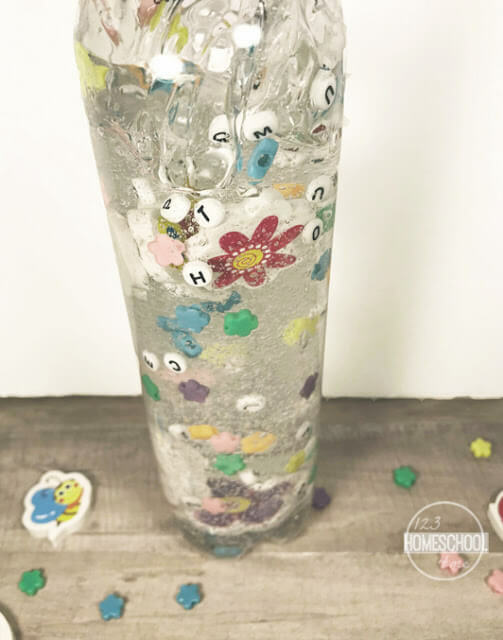 We use these I Spy Bottles in a few different ways. One is I call out things for my daughter to look for like specific letters or objects. She gets so excited when she finds them. For an extra challenge I will ask her to count how many of a specific object she can see. One time I even handed her an I Spy Bottle and asked her to go get dressed as if it were that season. She picked the summer bottle and put her swim suit on and when she wanted to play with the winter bottle she put on gloves and a hat. It was really fun.